We normally have sandwiches for lunch during the weekend. 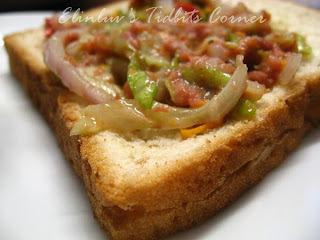 Open-faced sandwiches would be ideal for lazy people like Wild Boar... LOL! He whipped this up for us last Sunday after the kids water games. Too tired and too hot to eat out , we went straight home to rest and after an hour of rest, WB opened a can of corned beef and cooked it with cabbage and red onions and chilli as a spread for our open faced sandwiches. Simple and yet delicious. 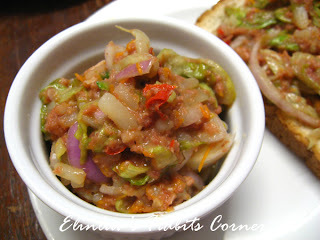 We spread the corned beef over a slice of bread and sat in front of the TV watching our favorite movie from Astro. We scheduled our movies for the weekend by recording them and replayed them when we are free to watch them like last Sunday. Chomping down the sandwiches as we watched the movie " While You Were Sleeping " starring Sandra Bullock and Peter Gallangar. This is what I called Bliss. This is how we spend our Sunday afternoon. Movies plus food makes a blissful Sunday . the canned corned beef is well flavored.